Don’t tell me you’re surprised about the object of his affection! I particularly love the romantic flower beside them. Such a nice touch. 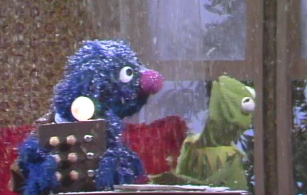 Grover makes it snow at Kermit’s. 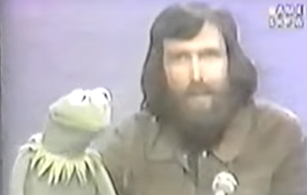 Today, I continue my look at Sesame Street‘s seventh season with the assorted clips that appeared as bonus features on the Sesame Street: Old School Volume 2 DVD set, a few of which I don’t have much to say about, so I’ll just breeze through those first. Two are two of the classic pinball machine counting animations, which you are guaranted to remember if you watched this era of the show (you can check one out here). Another features Buffy Sainte-Marie–a Canadian First Nations woman who appeared numerous times on the show in this era–singing “Wynken, Blynken, and Nod,” and in yet another, Bob plays a musical game of “Follow the Leader” with a group of children, some of whom have Down syndrome. This is a lovely segment, because Bob never points out these kids’ disorder but treats them exactly as the others, and they respond to the game just as the others do. Susan and Gordon don’t see Snuffy. 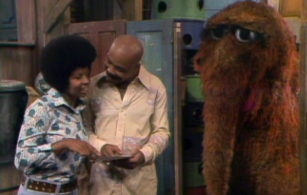 The seventh season of Sesame Street debuted on PBS on December 1st, 1975–fairly late, given it usually started up in September or October–with episode #796, which I watched for today’s post (and is available on the Sesame Street: Old School Volume 2 DVD set). And while I can’t really judge the entire season based on the premiere alone, it would seem that not much has changed in Sesame Street‘s evolution from last year to this one. There is still very little connective tissue holding the episode together, and, in some ways, I found it the least interesting one to watch thus far, but I might just be growing a bit impatient with watching full episodes of this by this point. 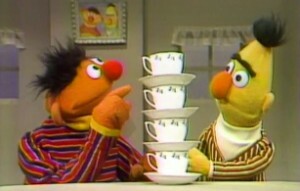 There’s some great individual stuff here, but, as an hour of television, it doesn’t hold up well.